Check out the great deal on Cabbage Patch Doll over at Amazon. 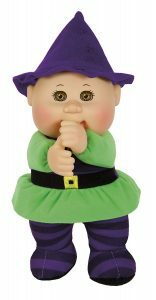 ADOPT A CUTIE: Cabbage Patch Cuties are soft, cuddly baby dolls that come dressed up as different adorable characters. These cute dolls resemble real babies with a fresh baby powder scent! HARVEST HELPER: Cabbage Patch Cuties presents the Harvest Helper collection, which includes Halloween dolls dressed in autumn style! You’ll love the fall costumes which include a bat, skeleton, witch, cat, and pumpkin. CLASSIC DOLL: Cabbage Patch Cuties are a classic doll that many parents remember having as a youth. These baby dolls have soft bodies and sculpted heads, resembling the iconic Cabbage Patch Cutie feel and look. WHAT’S INCLUDED: This Cabbage Patch Cutie is a 9-inch tall baby doll that comes with a fresh baby powder scent and nonremovable outfit. This toy is recommended for children ages 3 years old and up. CUTIES FOR KIDS: Any child, whether boy or girl, will love receiving a Cabbage Patch Cutie! Get the most out of playtime with these great dolls. They’re best for play and cuddling.